Top 20 Uses for GyroQ? GyroQ, the soon to be released MindManager add-in from Gyronix, has the capability to quickly queue up action items and ideas for delivery into mindjet maps. In the most simple form, you enter action items over a few hours and finally hit the “Send Queue” buttom to deliver the action items to a designated map (usually an “in-tray”). The goal is to maintain your train of thought on what you are working on, while also capturing ideas and action items that pop up with minimal interuption. Action Item due in a week. So how to best use the remaining 15? Here are a few ideas. As mentioned above, GyroQ lets you run a macro in the Gyro-Activator language. You can save a set of gyro-activator commands in a text file with a .gyr extension and run them manually or with ActiveWords. With GyroQ, you can associate these commands with a type so they run at the push of a button. Here are two simple scripts I’ve found useful. The first one loads my map central along with previously saved daily actions, priority actions, and review dashboards. The second script does the same thing, but first flushes the “queue” to the In-Tray and then generates and saves refreshed versions of the dashboards beforehand. These items can be pasted into GyroQ sequences. The advantage of this approach, beyond the convenience of getting all your dashboards refreshed and loaded in one step, is that in general Mindmanager seems to be more stable if you close and re-open newly generated dashboards. This may be related to the fact that this exercise frees up the sometimes large amount of memory consumed by the “undo” buffer associated with the dashboard generation step.Adding in the queue flush step also gets your actions items into your refreshed dashboards for processing. You can also use the GyroActivator commands to work within your maps. One handy feature I found use for immediately is dealing with daily repeating tasks (e.g. “emtpy your inbox daily”). People have taken an number of strategies to implement repeating actions. What I do is once I’ve completed the task for the day, I set the start date to tomorrow and the due date for tomorrow. That eliminates them from further dashboards generated that day. I never bother to mark them “done”. The “Type” menu pops up quickly and looks like the image below. This method of implementing macros personally feels more natural and rapid than assigning the macros to ActiveWords. That leaves 11 more “buttons” to put some useful code behind. I imagine for me it will used for a few frequent contacts to put in “contact about” or “waiting for” entries. A “someday/maybe” type might also be useful. A button could be set to add a “Project” rather than just an action item, when it is clear that is what is being added. The macro feature could be used to generate and insert “on the fly” a “map part” type branch to a map or perhaps even fill out an entire map by inserting specific text into places on a template. I’ll post updates as I figure out what ends up filling out my setup, but thought it would be useful to try to generate some discussion on best ways folks are using the types or would like to use them. What would be helpful is some kind of documentation for the GyroActivator language. While your examples are clear, is there a place where those of us who just acquired GyroQ can learn how to use this “language” to make our own macros? You can access the GyroActivator language documentation by clicking on the “GA Help” button that shows up in the lower left corner of the “Change Tag Settings” screen. Thanks – of course, I eventually found it after looking around for awhile. Thank you though, and thanks for a terrific site! Wow this GyroQ stuff is great! What I would really like is a script that would input a new Task in Outlook (ala the Outlook New Map part) , but also ask for a Category on the fly (that gets recognized by the Outlook Task). Is that possible? I’ve been using the tool only for a day and it’s changing the way I work! I don’t think you could have GyroQ interact with a Smart Map Part. You might be able to sync the task over to Outlook. I haven’t played with Outlook synchronization since my early days with MindManager. I prefer to just work from dashboards (either on-screen or printed out). It does seem like an area that most new users dive into right away and have trouble with, so its probably worth trying again and attempting to compile some tips on it here. I get a “Could Not Connect to Outlook” error on my home system when I try to use the map parts or synchronization so its off the table for now unless someone has some insight as to the solution to that. I’m not looking to do a direct synchronization to Outlook via GyroQ. I still want to queue tasks up and and review them in the destination map first. Right now I am Right-Clicking each Action Item that I want to be in my Outlook To-do list and choosing send to Microsoft Outlook as a Task. However, it would be nice to have the tasks already Categorized when they arrive in the Daily Capture Map. I gave that a try (by adding it to your Action Item Due Today tag) and it does prompt me for a category. 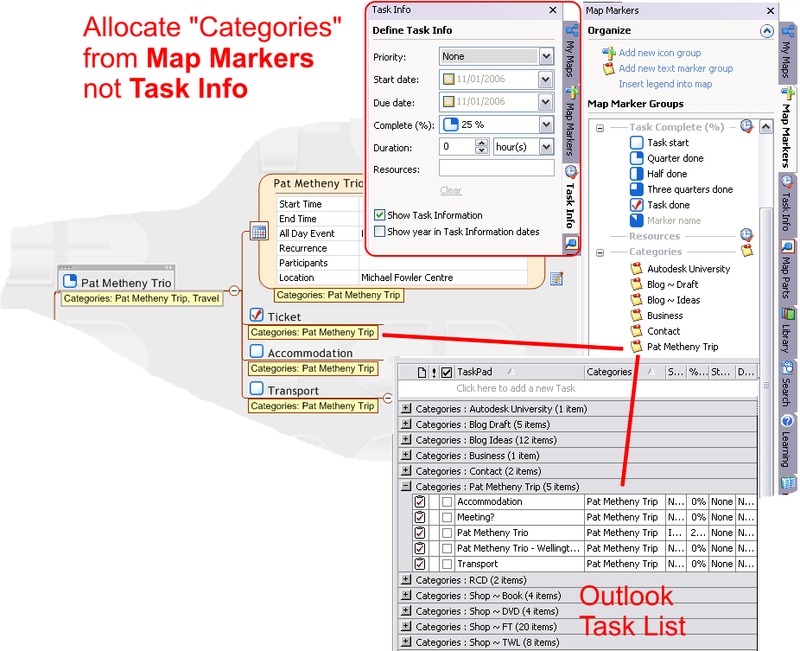 However, when it gets to the map, there is no category associated with the task. Did I put it in the correct place (or am I leaving something out)? Sorry, the rm_categories command requires ResultsManager to be installed. Using GyroQ for Taking Notes from Web-pages as an Extended GyroQ Command. What is the GyroActivator code to be used for enabling GyroQ to automate Notetaking from web-pages? Obviously, doing this manually (selecting text, copy to clip-board, paste to GyroQ, insert to Daily Map) is very long-winded if one is taking tens to hundreds of notes daily. I would like to be able to Open GyroQ, Select an Extended Command that will Open my web-browser, I open web-page of interest, Select text (and pictures etc. ), Copy to Clip-board and the Extended Command will insert this directly to GyroQ (or directly to the Daily Map, the MindManager Brainstorming page or other pre-selecred map) then wipe the clip-board clean and repeat the actions for subsequent text selected. I am sure this would be a fantastic Extended GyroQ Command for all of us who have to make extensive notes from web-pages. The clipboard information has to go to the queue file as plain text so it doesn’t handle much more than plain text notes (e.g. pictures, rich text etc). You’d need to contact Gyronix to suggest developing extended functionality. It prompts you to optionally add clipboard info as a hyperlink or a note. I find it particularly useful for bookmarking a site I want to come back to. It could be customized to do one or the other (or both) automatically and to send to a specific map without prompting. The daily activity “set to tomorrow” macro looks to reset all activities due today with a startdate of today. How would you filter out non-repeating one off activities that also start and are due today that you might add with “4: Action Item Due Today”? Hi Mark – the “dit” tag pushes our the start date /due-date of a selected task. I don’t think it would impact all activities unless you had them selected. The approach on repeating tasks has evolved quite a bit since September 2006. There is now a “mark_task_complete.mmbas” macro, which can be assigned to the topic context menu or run by the “mtc” gryoQ tag. This macro looks at the category field of tasks it is run on to automatically determine whether to mark them complete or advance the dates forward by various periods. It also can log the completed tasks to a floating topic and/or a “completedlog.mmap”.